Noodle is made from unleavened dough which is stretched, extruded, or rolled flat and then cut into pieces. 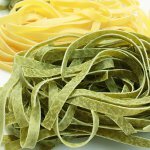 In British English, the word “noodle” refers to flour paste products in the form of long, thing strips. In American English, it is an inclusive term denoting flour paste products cut into any shape, although long, thin strips are the most common. Noodles are typically prepared by boiling and served with a sauce or in a noodle soup (by the way, chicken noodle soup is a common comfort food in the United States). They can also be pan-fried or deep-fried. Some noodle varieties (for instance, glass noodles) can be served cold in salads. All noodle varieties can be divided into several groups according to primary ingredient. There are wheat noodles, buckwheat noodles, and rice noodles. Some Korean noodles can be made from other ingredients such as sweet potato starch, acorn flour etc. To celebrate the National Noodle Day, cook your favorite noodle dish and treat your family to a delicious meal. You can make noodle soup, noodle salad, noodle casserole, or pasta with sauce.